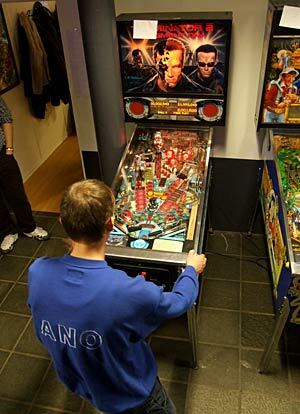 Location: Pinball World, Olaf Ryesgade 7K, 6000 Kolding, Denmark. 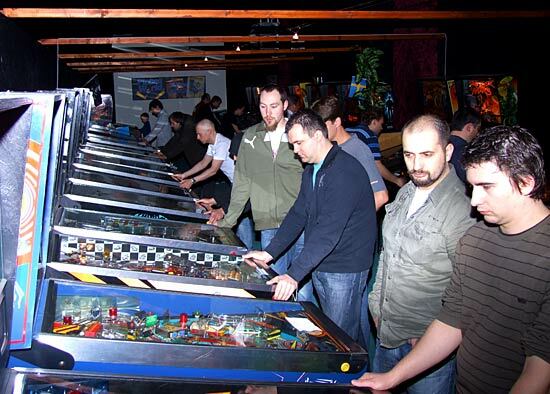 The European Pinball Championship was revived in 2005 when the Dutch Pinball Association held the first of the new championships in Amsterdam. 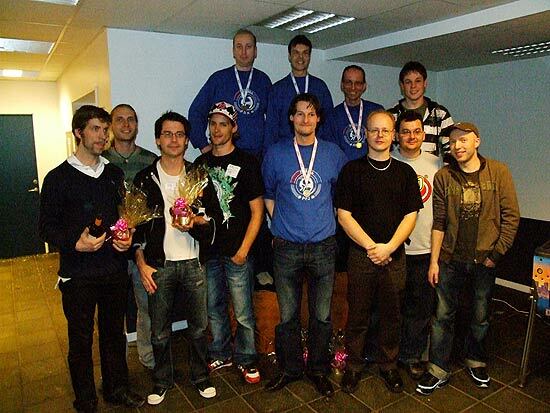 Since then, tournaments have been held in Germany and Sweden but in 2008 it was Denmark's turn to host the event. 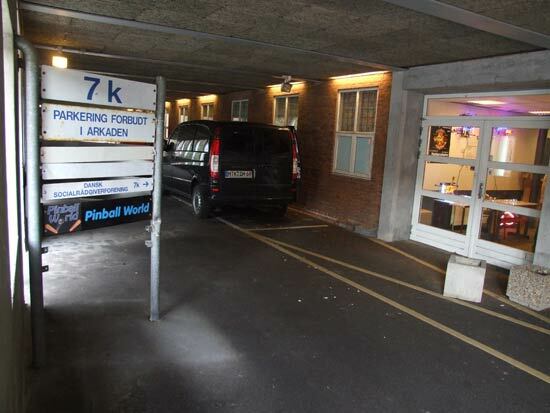 The location chosen was the Pinball World facility in the town of Kolding, about 200km west of the country's capital Copenhagen. 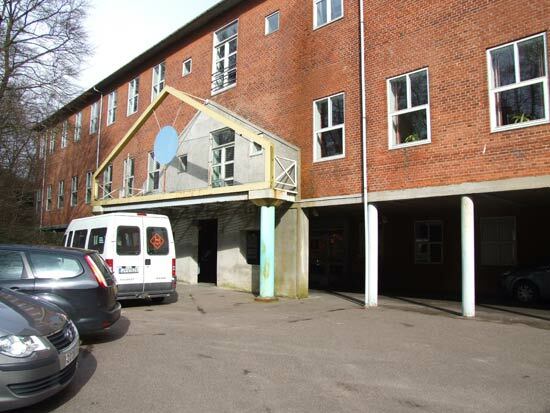 Kolding is Denmark's seventh largest municipality with a population of 86,000 with good access by rail, road and sea. For our trip, we combined a flight to Copenhagen with a 3 hour train journey to emerge from Kolding's train station on the doorstep of our hotel. From there it was a 15 minute walk through the centre of the town and out the other side to arrive at a light industrial area. We didn't see any signs to direct us until we arrived at the building itself, indicating this wasn't a championship aimed at non-pinball fans, and anyone who wanted to play would already know where they needed to go. That sense was confirmed when we arrived at the door. 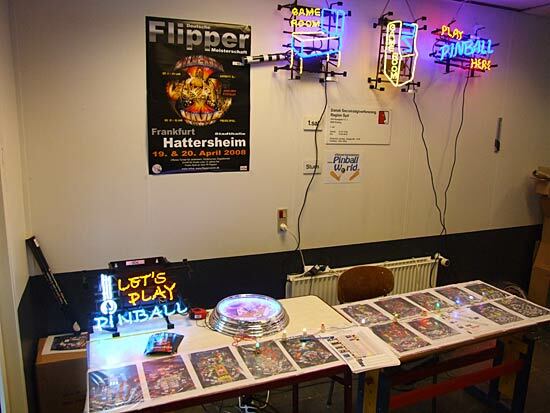 Directly inside the entrance were two tables featuring LEDs and neon signs from Albert Mediallon's Pinball-LED company. Opposite Albert's tables was a Theatre Of Magic game fitted with LEDs instead of incandescent lamps. 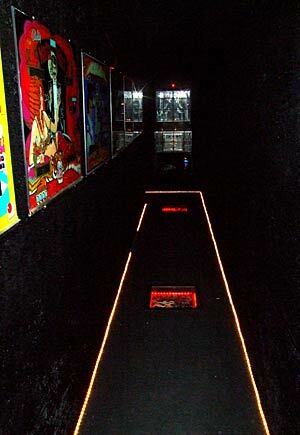 The effect was quite striking though opinion was divided over the merits of using LEDs for all pinball applications. Next to Albert was a small stand by Pinpartshop who had some show specials on lamps, displays, DVDs and tumblers. These were the only pinball vendors. 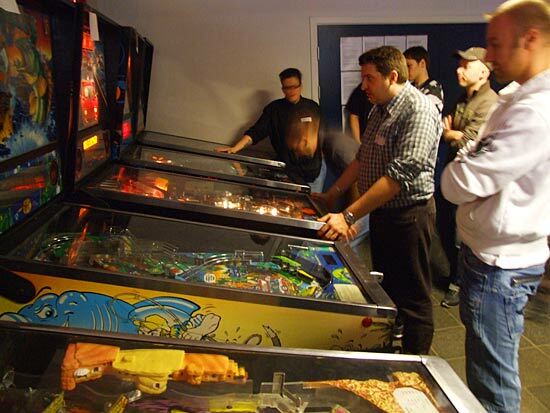 The rest of the Pinball World facility was dedicated to machines and tournaments. Turning around from the Pinpartshop display in the lobby, we come to the first of the tournament machines. Whitewater, The Flintstones, Fish Tales, High Speed 2 - The Getaway, Bram Stoker's Dracula, No Fear, Terminator 2, Gilligan's Island, Hurricane, World Cup Soccer, Cirqus Voltaire and Creature From The Black Lagoon. From the lobby, a doorway led to the registration and rest area. It was here that players and teams could register for the EPC, Country and other tournaments. 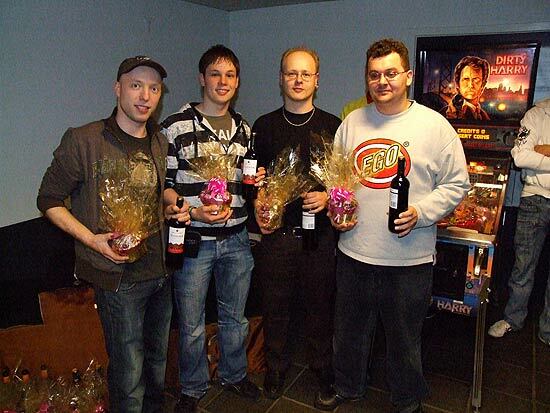 Entry to the EPC tournament cost 200 Danish Kroner which is £21, $42 or €27. That bought you three attempts to qualify for the final rounds on Sunday. Additional entries could be purchased for an extra 50Kr (£5/$10/€7) each up to a maximum of 7 attempts. Taking all 7 entries would cost a competitor 400 Kroner, that's £42, $84 or €54 making it an expensive tournament to enter if you didn't qualify in your inclusive attempts. Hot dogs - 15Kr, pasta salad - 15Kr, cans of soda - 10Kr, cans of beer - 15Kr and tea/coffee/hot chocolate - 5Kr. The rates used for conversion were; 10Kr = £1.04, $2.10 or €1.30. With so many different European nationalities represented, English was used as the common language with team-mates or fellow countrymen translating where necessary. There were four pinball machines in the registration area - a black Spider-Man, a Mr & Mrs Pac-Man, a Triple Action and a strange hybrid machine featuring a translite from the movie The Longest Yard, a Judge Dredd cabinet, a popeye playfield with parts from Last Action Hero, Jungle Lord and several others. These machines were all on paid play at 10Kr per game with the Spider-Man and Mr & Mrs Pac-Man hosting mini-high score tournaments. The registration room was also the place to come and relax with tables, chairs and magazines provided. 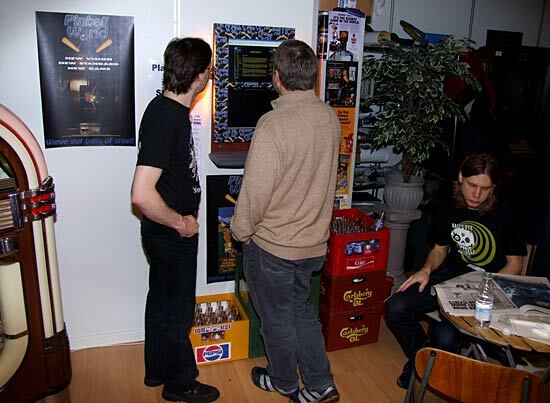 Tournament status was updated on the Pinball World website and a dual screen computer terminal was set up to allow players to check their status. Alternatively, free wi-fi was available for those with the necessary equipment to use it. The whole room was filled with various posters, artwork and assorted pinball paraphernalia which really made for a totally immersive pinball experience. The main room was accessed through the lobby, or from the registration room via the impressive corridor shown below. The corridor was totally dark except for the lit floor edging and the inset perspex panels. These contained various arrangements of pinball parts illuminated with red lamps. The wall was lined with pinball backglasses although these were not lit making them easy to miss. At the end of the corridor, before it turned left into the main tournament room, was a caged Space Invaders pinball. It was placed behind a metal grill as though it was too dangerous to be allowed out into the wild. The darkness of the corridor matched the lighting in the main tournament room. The photographs you see in this report are all taken with a flash simply because it was far too dark to take pictures without one. Consequently, they had to be taken during the practice period and not during tournament play. 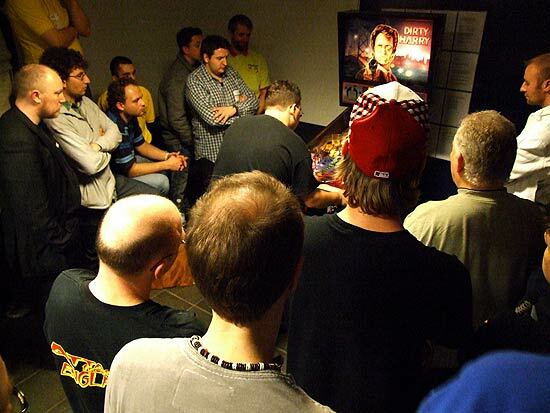 There were 47 machines in the tournament room, 20 of which were used for the EPC. The remainder were recreational play games. The two were mixed together in the room with a piece of paper stuck on the playfield glass to indicate if they were reserved for tournament play. Machines were arranged in two long rows stretching the length of the room. There were two gaps to allow entrance from the lobby and the registration room corridor and there was a third, shorter row of machines (below) behind a screen on the right of the picture above. 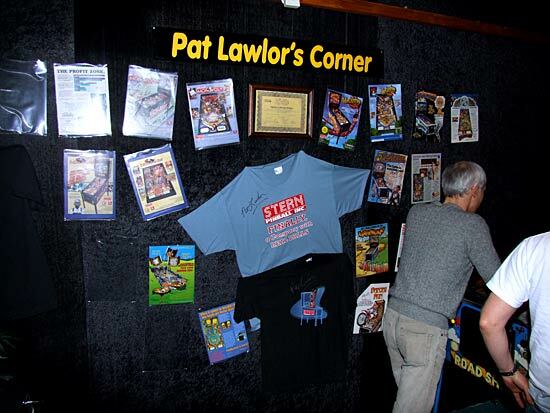 At one end of the room was a shrine to game designer Pat Lawlor, featuring all the games he designed for Williams/Bally and a wall with signed flyers, t-shirts and a framed Addams Family Gold owner's certificate. There were two main tournaments - the EPC and the National Team Tournament as well as individual game tournaments on Spider-Man, Mr & Mrs Pac-Man and the hybrid Judge Pop-Lord machine. The teams assembled in the lobby as play began. The teams were split into two groups of six with each team playing a match against all other teams in their group. Each match consisted of two rounds starting with a two player four ball game where each member of the team played one ball. The winning team earned 5 match points. The second round split the each team into pairs and a pair from one team played a pair from the opposition team in a four player, three ball game. The other two pairs did the same on a different machine and scored more match points. The winning player on each machine scored 9 points, there were 5 points for second and 2 points for third. At the end, all the match points were added together and the team with the most points had won the match, earning 2 team points. Teams filled in the score sheets themselves and handed them in when completed. 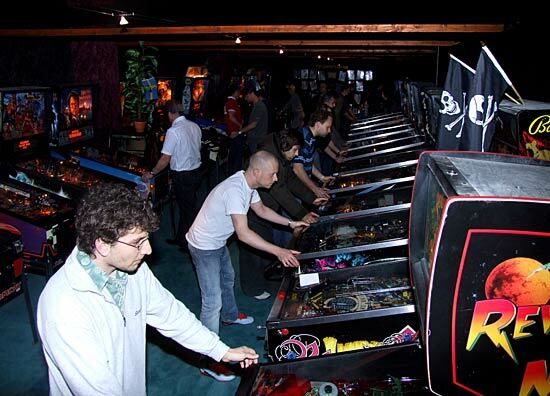 There were pauses between rounds since some matches took longer to finish than others but unlike in previous years, there was no attempt to prevent players practicing on the tournament machines during these pauses, including those they were about to play. 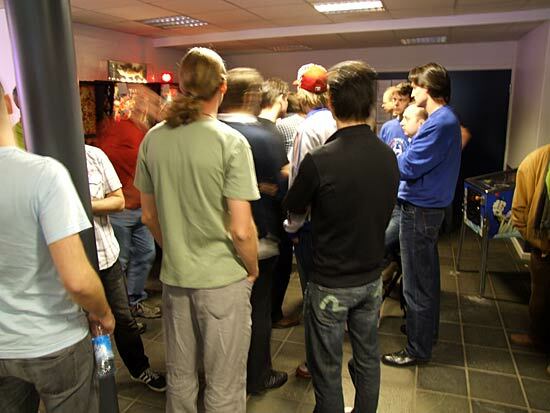 There was also a problem with people trying to get in and out of the main tournament room through one of the two doors which led into the middle of the Team Tournament. With limited space for competitors in the lobby, that door should really have had a sign saying it was out of use during the tournament. The top two teams proceeded to the semi-finals. The Netherlands 1 team finished ahead of France in Group B as they had a higher match points margin of victory (122-63) than France (120-65). The semi final saw the top teams in each group playing the second team in the opposite group, so Sweden 1 played France and two Dutch teams played each other for a place in the final. 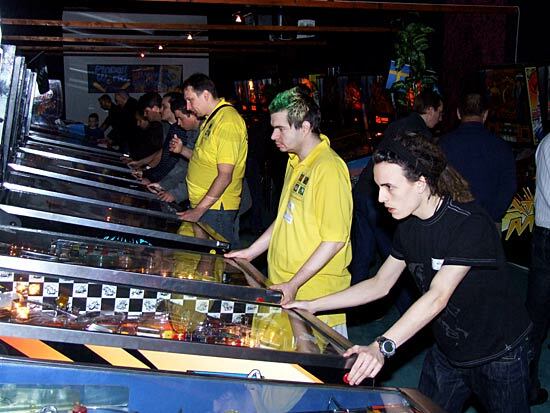 In those semi final matches, each team could choose two machines each to play and, as in the first round, the teams split in two and played two four-player games on those machines. By the end, it was Netherlands 1 and Sweden 1 who were through to the final with France and Netherlands 2 playing for third and fourth places. 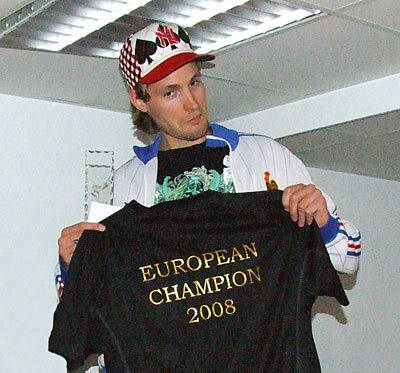 In the end, it was the Netherlands 2 team who triumphed to take third place, leaving the French team in fourth - the same position they finished in 2007. Then the final took place with Sweden playing the Netherlands 1 team. 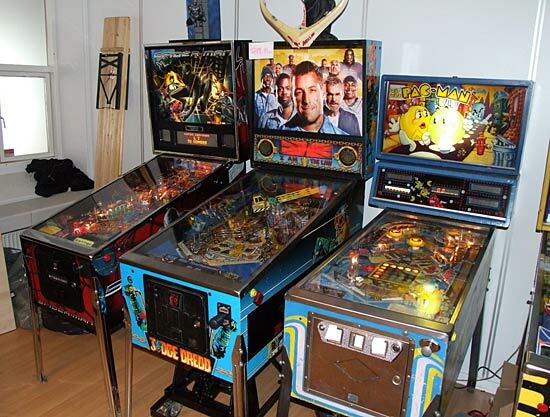 Four machines were played as in the semi-finals with two chosen by each team. They were World Cup Soccer, No Fear, Hurricane and Terminator 2. The Netherlands team took a narrow 9-7 lead after World Cup Soccer, but Sweden came back with an 11-5 win on Hurricane. No Fear gave the initiative back to the Dutch side with their 11-5 win which meant everything depended on the last game to finish which was Terminator 2. With Holland leading 25-23, either side could win, or it could end up a draw. In a tense finals with plenty of super jackpot possibilities, it was the Dutch who capitalised on their opportunities and ended the game with 260M and 110M against the Swedish scores of 75M and 26M. 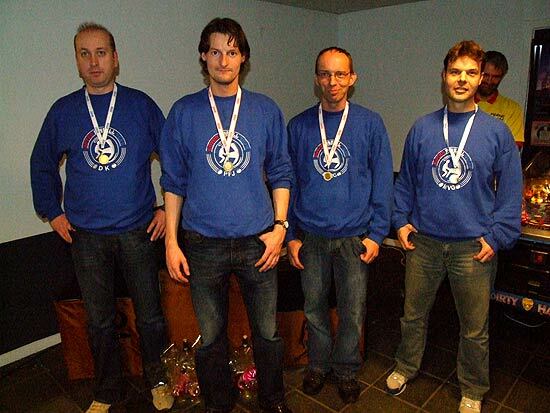 So it was that the Netherlands 1 team who retained their title of European National Team Tournament champions. Meanwhile, the individual tournament was in full swing in the adjacent room. 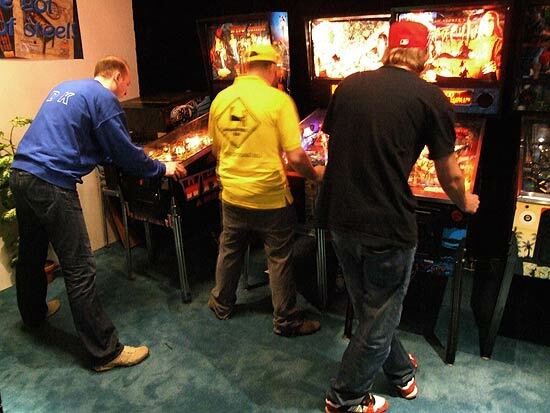 The European Pinball Championship began on Friday evening at 6pm and continued until the end of Saturday evening's play at 11pm. Competitors received three entries for their money and each entry consisted of three games on machines of their choice from the 20 available. After each machine was played, a tournament official recorded the score on the player's score sheet and when all three machines had been played the scores were passed to the registration desk for entry into the computer system. The competitor could then play their second and third entries but if they chose, they could purchase up to four further entries for 50Kr each making a total of seven entries. When the three scores were recorded on the computer, they were ranked against all the other scores for those machines and ranking points were awarded to the player. The total of the three ranking points was the player's score for that entry. Their highest scoring entry was the one that counted, although lower scoring entries remained in the system and continued to influence the rankings. The highest score on a machine earned that player 100 points, the second highest got them 90 points continuing down to 6th place earning 50 points. Thereafter, places were just 1 point apart from 7th place at 49 points down to 55th place at 1 point. Beyond 55th place, no points were awarded. Players could also choose to void an incomplete entry, although it still counted as one of their seven attempts to qualify. They might do this if they had one good game and one poor game since the entry would never be enough to qualify, but the good game might knock one of their earlier entries further down the rankings. On Sunday morning, the 32 top qualifiers played their second round matches in a double elimination format. The players were split into two groups of 16 and then into pairs with the top qualifier in each group playing the bottom qualifier, the second top playing the second bottom and so on. 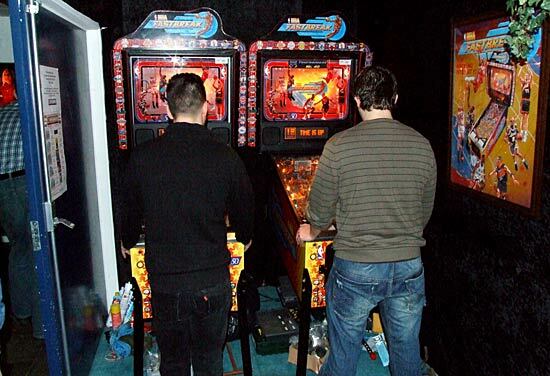 Both groups played head-to-head best-of-three matches on randomly selected machines but the second group were deemed to have already lost one match and so placed in the loser bracket where a single lost match would result in elimination from the tournament. Players in the first group could lose one match and drop down to the loser bracket without suffering immediate elimination. The second round reduced the number of players in the top group to eight, with the losers entering the loser group to continue playing. After several rounds of double elimination play, the final four players were decided. They were: Brenn Oosterbaan and Jorian Engelbrektsson who were undefeated from the first group plus Franck Bona and Ingo Gerhardt from the loser group. 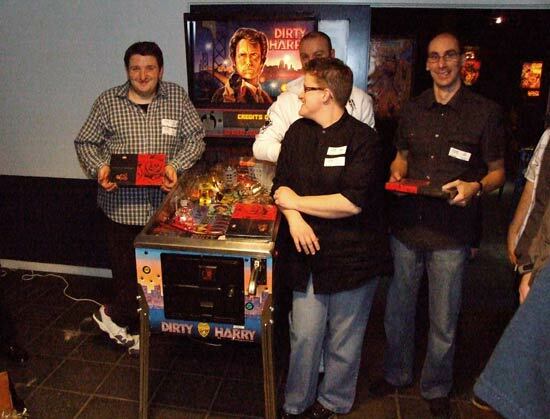 The EPC final consisted of a single 5 ball game played on a Dirty Harry machine set up in the lobby. 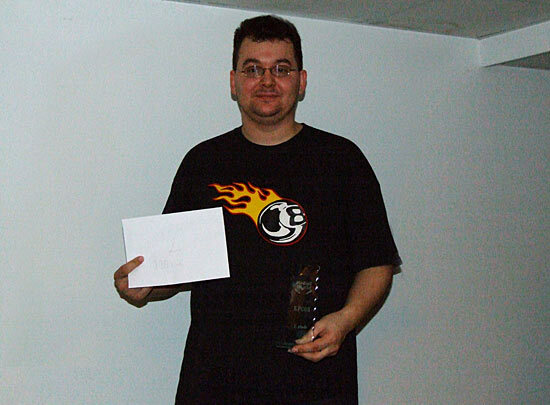 As the highest placed qualifier, Brenn had the first choice of playing position. 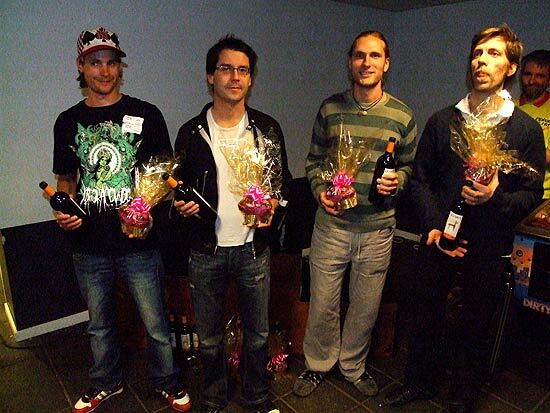 He, like all the finalists, chose to play in the last position available making the playing order Ingo, Franck, Jorian and Brenn. Players and spectators watch the Brenn play in EPC final. The first ball saw Franck take an early lead with 82M against the others' scores of 42M, 27M and 23M but it was still wide open with four more balls yet to play. After the second ball, fortunes had changed as Brenn boosted his 27M first ball score to 104M and first place. Franck had improved only marginally to 89M as had Ingo to 67M and Jorian with his 35M. The third ball brought a further boost to Brenn who increased his lead with a 299M total score against the nearest challenger who was Jorian on 170M. Early leader Franck had dropped to fourth with 102M while Ingo raised his score to 163M. Ball four brought the players much close with good performances all round. Brenn still held the lead with 537M but Jorian was breathing down his neck on 490M. Franck was not too far behind on 267M closely followed by Ingo on 231M. So ball 5 was the be the decider. Ingo played first but could only raise his score slightly to finish on 275,116,780. Franck played next and confirmed his third place by finishing on 339,247,370. That left Brenn and Jorian to battle it out for the top spot. Jorian played next and more than doubled his score from a second multiball with a series of 50M jackpots and three super jackpots to end on 1,039,557,190. It was a daunting task for Brenn to match that performance and luck was not on his side this time as he ended his game on 592,488,150; making Jorian the new European champion to add to his PAPA World Champion title. Jorian had to rush off straight after the awards ceremony to join the other Swedish players who had to hurry to catch their plane from Copenhagen airport. It sounded an impossibly short time to make the long drive but hopefully they made it. 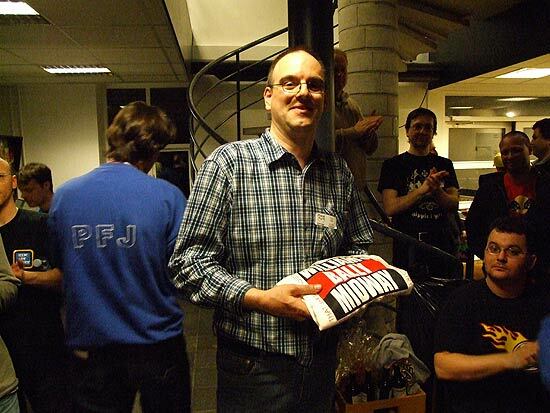 In other tournaments, the classics played on Mr & Mrs Pac-Man was won by Jörgen Holm from Sweden and a mini tournament held on Spider-Man was won by Hungary. 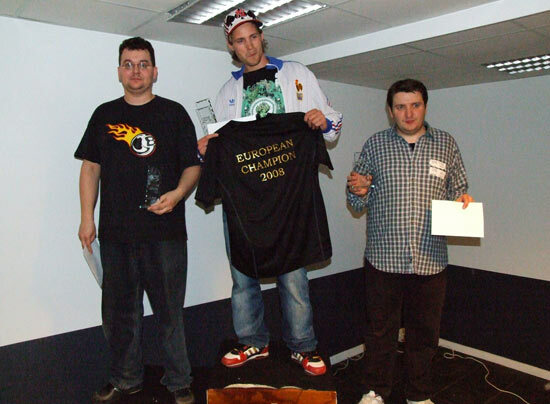 Which brings us to the end of another European Pinball Championship. 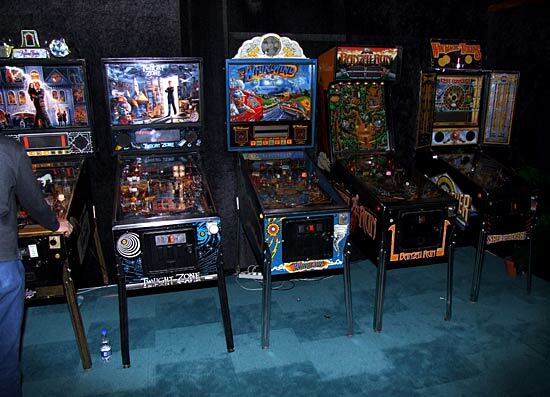 The Pinball World facility was a modern pinball enthusiasts dream with a great selection of dot matrix machines brought together in an atmospheric setting. The small, but enthusiastic team of organisers did a good job registering players, entering the scores and serving at the snack bar. Holding a large tournament like the EPC did bring some problems though. 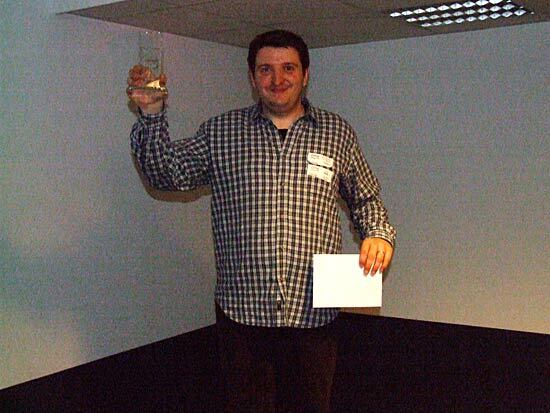 While the low lighting levels in the main tournament room created a good atmosphere, several people commented it was too dark and they couldn't see the ball properly. As is almost inevitable with an event such as this, machines did suffer mechanical and electrical failures. Two of the three machines I chose both had significant issues - Lord Of The Rings didn't detect shots to the ring 99% of the time (so no modes, Ring Frenzy jackpots or Destroy The Ring) and the Path of Adventure on Indiana Jones didn't tilt. That wouldn't be so bad but you have to wonder if they worked earlier in the day or the previous day when higher scores were recorded. There was a general lack of information posted around the building and no quick way to check on the progress of the tournaments apart from using the single monitor provided (unless you brought your own computer). 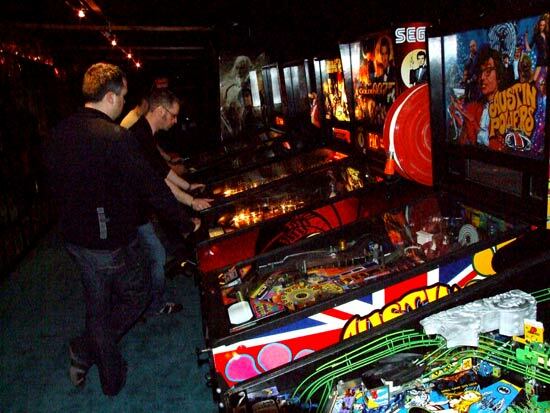 The tournament machines in the main room were only designated as such by a small hand-written note taped to the playfield glass which many people missed. But probably the biggest problem was people practicing on the tournament machines. There wasn't enough supervision to prevent this or to prevent people starting a tournament game and simply walking away or not recording it if the score was too low. This was observed several times. This year's EPC format was unique in allowing competitors the chance to buy more entries after they had played their initial allowance. While this is common practice in the US, in Europe it is customary to create a more level playing field by allowing everyone the same number of entries regardless of the depth of their pockets. 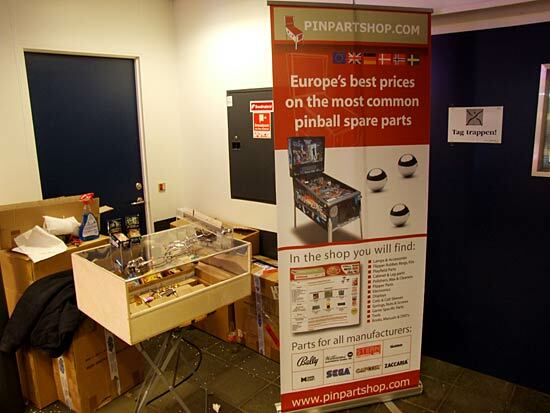 However, despite these shortcomings everyone appeared to enjoyed themselves and appreciated the huge amount of work put in by the Pinball World organisers to hold the EPC in Kolding. Congratulations to them and to the winners. 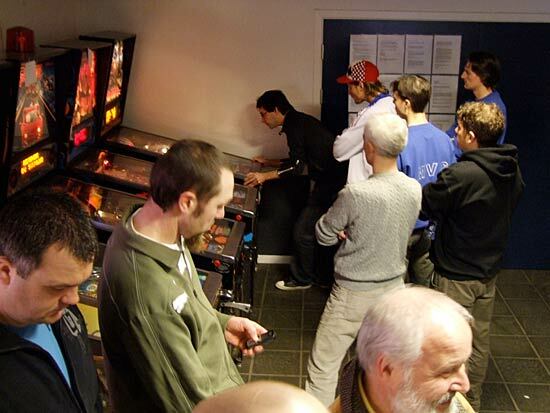 Next year, the 2009 EPC will be held in the United Kingdom at the UK PInball Show. 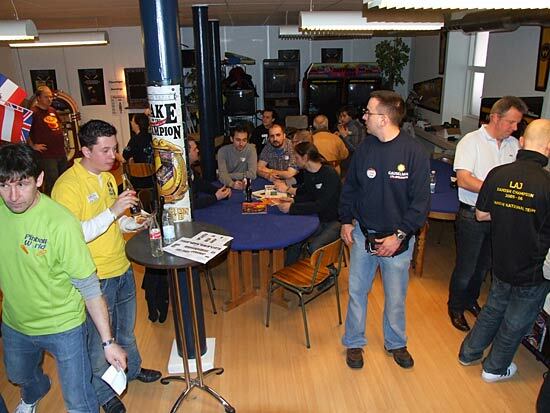 It will be later in the year than the 2008 EPC, probably around September, and the Pinball News crew will be not only reporting from it, but helping to organise it too. You've read about the show but now you can see it in action for yourself with our exclusive Pinball News Two Minute Tour. 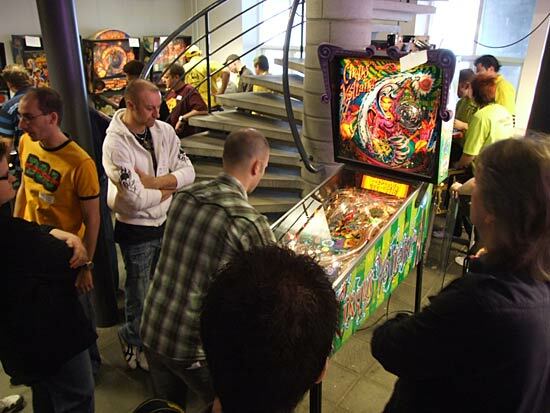 Simply click on the play button below and take a walk around the European Pinball Championship 2008.